I really love Netmums and was delighted when I was asked to review The Ultimate Baby & Toddler Q & A. For new parents, although the internet can be a godsend, it can also be a curse. It's hard to navigate the wealth of information and often a well researched thought out book can be a huge help. This book is compiled by Hollie Smith, a regular Netmums author, with contributions from a paediatrician, two health visitors and a psychotherapeutic counsellor. A lovely feature of the book is small excerpts from parents. If you read carefully you may even see some from yours truly. The book is framed around 50 commonly asked questions, around key ages Newborn, 0-3 months, 3-6 months, 6-12 months then 12 months +. Each section has 10 questions, and it's very easy to find what you are looking for. The questions are ones we've all probably asked ourselves like "is it OK to bring her into bed with me?" "How do I bath her?" "Should I go back to work?" 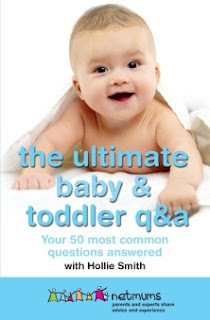 I will say that whilst it's called the Ultimate Baby and Toddler Q & A this is, essentially, a baby book, and a very good one. The art of the toddler is covered briefly by the ten questions which include "when will she start walking?" "when will he stop napping?" and "what's with the tantrums?" I think its a lovely introduction into dealing with toddlers, but not comprehensive, and nor is it intended to be. The book, I think, is designed to be bought towards the beginning of your parenting journey with your baby. What I loved most about the book was the combination of sound, well researched advice and parents stories. It gives the book a very accessible feel. It's also very reassuring, the parents that are chosen cover a broad spectrum, and the advice is very sensible. It's a book that lends itself to quick reference just reading the bit you need at the time, but also reading from cover to cover too. From the point of view of a parent of a premature baby, prematurity is mentioned (and is indexed) in the book, but is not comprehensive. I would argue that such a book may prove useful once your baby is a little older than newborn. I am delighted that there is information and advice from parents like me in the book and it feels very inclusive. I personally would have found this book valuable from about 6 months onwards (3 months corrected) and highly recommend it, it would also make a lovely baby shower gift or in a parcel for a new mum or dad. It's such a difficult one for any parenting book to cover, because premmie babies are in a minority. I think a book would be great, but it's a tricky one, as the world of premature babies is so varied. I have considered it many times. Time to think again! I've canvassed premmie mums before and can't seem to get consensus on whether a book would be useful. I think I'd love to write a personal memoir with practical tips, starting from discharge, but still not sure. I wouldn't want to spend the time on it if it wasn't marketable.